London: Eating pulses (legumes) on a regular basis can slash high blood pressure, suggests new research. Diets rich in peas, beans and lentils appear to lower readings and reduce the risk of heart attacks and strokes. 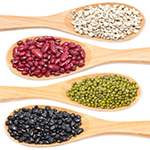 Researchers at Harvard University carried out a review of previous studies on the effect of pulses on heart health.